Partnership, commitment and competence for the automotive production of tomorrow! Which current topics is inpro involved in? Find out! “For me personally, inpro is the innovation melting pot par excellence. 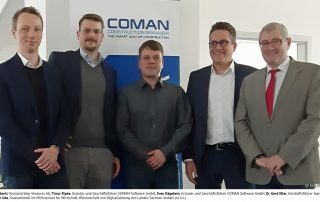 On March 27, 2019, the young IT company COMAN Software GmbH invited to its headquarters in Stendal, Lüderitzer Straße 3, under the slogan “Promoting Innovation and Strengthening the Business Location”. The COMAN software solution is already established in the automotive industry and in mechanical and plant engineering at Daimler, Volkswagen, Siemens and thyssenkrupp. The inpro spin-off is set to revolutionize project management in other sectors as well, such as the construction industry. The growing company presented its solutions and plans to representatives of industry associations, the state of Saxony-Anhalt, the university, politics and investors. The founders, Sven Kägebein and Timur Ripke, would like to realize their visions with a team from the region and offer an agile employer with personnel needs and potential for IT specialists returning to the Altmark region or long established there. 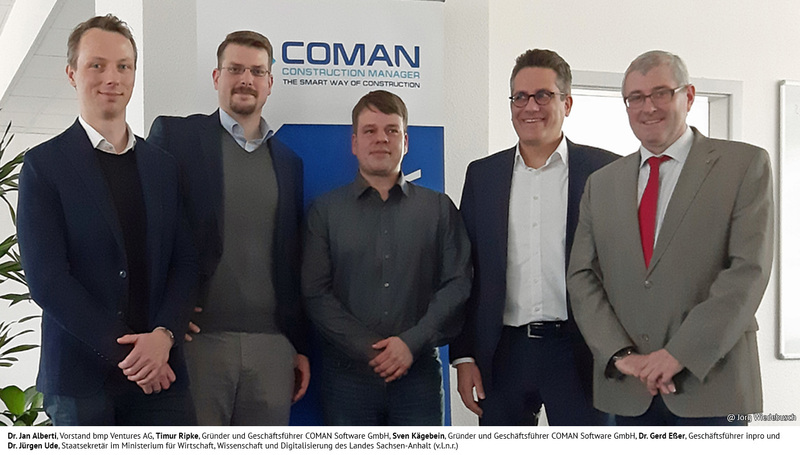 The innovative power of the COMAN software is great and with the funds of the bmp investor group, the business location in northern Saxony-Anhalt can be strengthened in the long term. State Secretary Dr. Jürgen Ude sees “good chances for the team to do something for the region and even become world market leader with its product”.